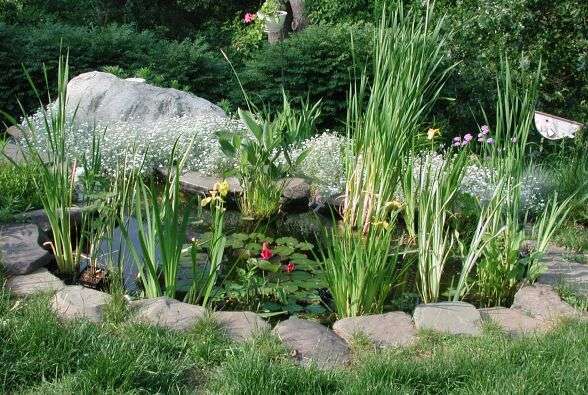 The pond was constructed in the fall of 1999 and actually consists of two ponds connected via a short stream and a waterfall. The total water volume is around 1,000 gallons. 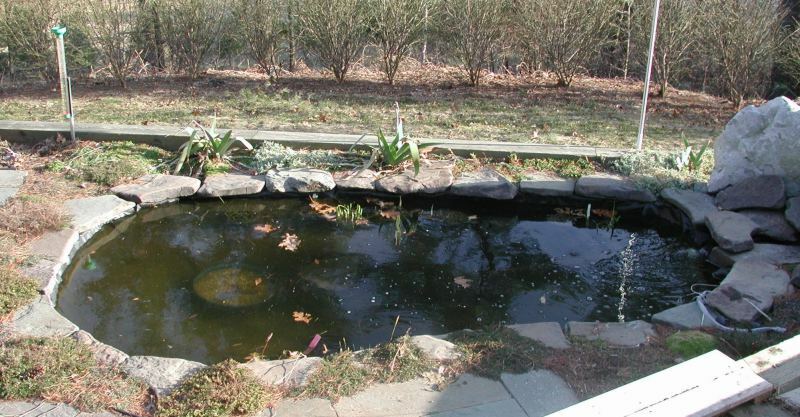 The pond is instrumented to the extent of having a camera (see below) and a temperature sensor in it. See the Chicken RFID page to see my latest project. The full gory details of the local weather can be found on this page. All graphs can be seen here -- this includes a calendar for historical information. I've just started a new page which describes the various sensors that I have. For all the news, please see the diary. 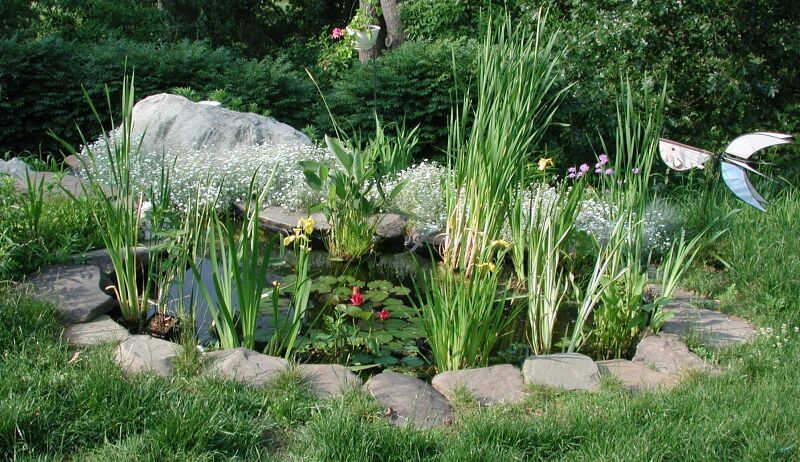 The top pond is where one of the frogs lives -- it is also where the tadpoles were placed. However, at least one of them went down the stream (to the top left) and into the bottom pond! Both ponds are lined with permalon (X210-G) which seems to work just fine, and have a marginal shelf that was constructed out of paving slabs (cheap stuff from Home Depot). The brown (no grass) region round the edge of the pond is due to the liner running out that far underground. It is about four inches deep, but that affects the amount of water available to the grass -- so it dies! The lotus is sitting on the shelf at the bottom of the picture (because there is no good place for it on the bottom of the pond). 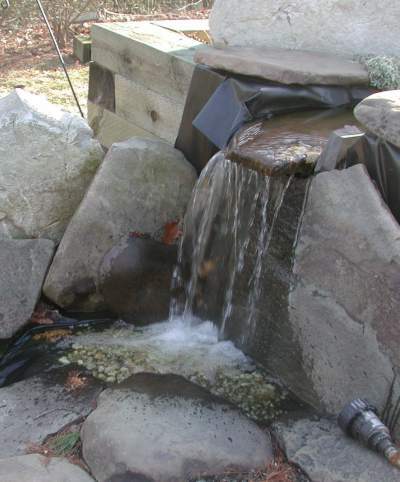 The waterfall has about a two foot drop into a small pool. This makes a nice noise that drowns out the noise of the road! At the present, a significant amount of the Permalon (aka black plastic) is showing, but we are trying to grow a large fern to cover it. Also we are trying to get plants to cascade downwards. This is the area that needs the most work. We planted the fern in the fall of 2000, but nothing has happened (yet). In the April 2001 picture, you can see the camera pointing at the waterfall for testing purposes. This pond is around 7ft by 13ft and contains the fish (hence the rather unimaginative name). When the July 2000 photo was taken, it was suffering from foam from the waterfall (which is off to the right). The depth is somewhat under two feet. There is an overflow at the back left. For the horticulturalists amongst you, the plants around the front edge, between the stones, are various sorts of Thyme. Since the camera is out of the pond for the winter, camera views were recorded on 11 Nov 2003 (maybe!). This is a view into the pond from underwater. This is the Mark 2 pondcam made from a cheap full resolution CMOS NTSC video sensor. It fit in the original housing that I built for the mark 1. [The mark 1 was killed by a lightning storm.] The mark 2 seems to be markedly less sensitive though it could be that it is looking underneath the lily pads, and hence is in the dark! Also I need to get the focus set right -- at least this module has an adjustable focus on it! If the image on the right is not streaming, then you can choose one of the following links: Windows Media (100k), Windows Media (40k), RealVideo (100k), RealVideo (40k). The camera is currently in the pond -- however the algae now likes to grow on the front pexiglass viewport which makes the image appear murkier than it really is. Also the colour balance is off, but that I may be able to fix in software. If anyone has any ideas how to keep the front clean, then please send me email at the address below. I received an interesting idea that said that if you pass a small current between the glass and another electrode, then the algae will not grow. This I am in the process of trying. Information on the construction of the camera and other details now has its own page. See the pond life section. See the plant life section. I was hoping to get away with only a very simple filter made out of furnace filter and a milk crate. However, nature conspired against me, and I now have a Cyprio Biofloc 1000 which gets about half the water circulation. When it was newly installed, it clogged up every day and so I rinsed out the foam, even though the instructions say not to. It is unclear what other choice I had! After a month, things have stabilized and it only needs cleaning each week. 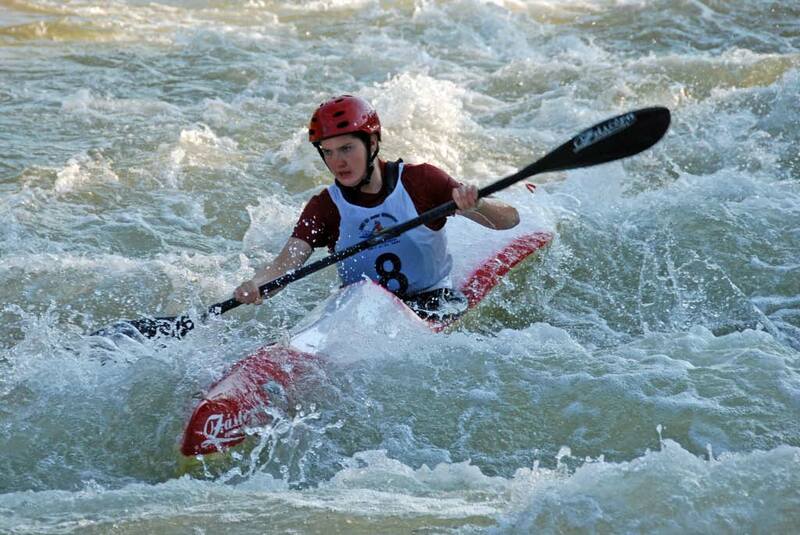 The pump is a Sequence 750 which lives in a small pump house and is (just) below the normal water level. 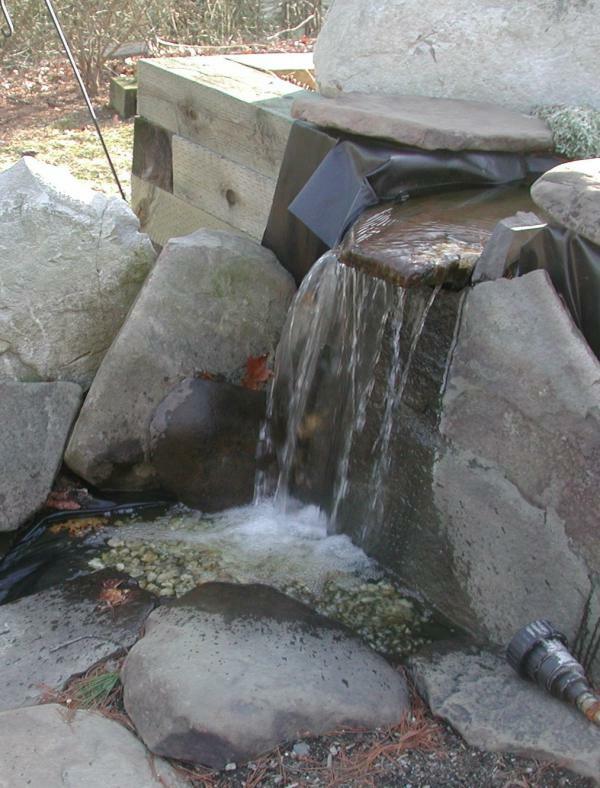 I get around 1000 gallons per hour over my two foot high waterfall. The milk crate/furnace filter finally clogged up on me in the spring of 2001. The design needs work to make it possible to clean it effectively. So far in 2001, algae has not been a problem. This the bane of my existence. Up until the middle of June, the water looked like pea soup. I had tried Daphnia, some patent microbes, etc. Nothing worked. Then I added a filter, and a tablespoon of Muriate of Potash (Potassium Chloride for chemists). Within a week, the water was clear(ish) and you could see more than two inches. In particular, the fish can now see people, and swim over in the hope of getting fed. I'm intending to keep adding Potassium during the summer to see what happens. APRSWXNET history or see how it works.